PRESS RELEASE: Roland marks a new RD series milestone with the introduction of the RD-700NX, an instrument that raises the bar for onstage performance with its incredible sound, touch, and control capabilities. This flagship stage piano is packed with professional features for gigging keyboard players, including Roland's SuperNATURAL Piano sound engine along with newly developed E. Piano based on SuperNATURAL technology, the finest keyboard action: PHA III Ivory Feel keyboard with escapement, a unique Sound Focus feature, and a large, high-resolution LCD screen. On board the RD-700NX are three stunning grand pianos (with 30 variations), all driven by the SuperNATURAL Piano sound engine. SuperNATURAL Piano offers the ultimate playing experience, delivering seamless variations in tone from pianissimo to fortissimo, notes that fade naturally without looping, and three-dimensional sound and response. 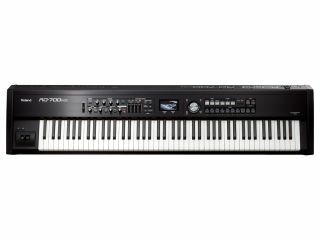 The RD-700NX is also equipped with E. Piano sounds based on SuperNATURAL technology which offers accurate models of various classic electric pianos from the 60s, 70s, and 80s. Going far beyond standard sampling of electric pianos, the SuperNATURAL technology enables complete control and expressivity, giving players the ability to customise sounds and create entirely new electric piano voices. For a true grand piano playing feel, the RD-700NX is fitted with the PHA III Ivory Feel Keyboard with escapement. This keyboard offers maximum comfort, playability, and response, and perfectly conveys dynamic, velocity-based tonal changes. This supreme keyboard action draws maximum expressivity out of both SuperNATURAL Piano and E. Piano sounds. Additionally, the keys feature Roland's acclaimed Ivory Feel, a comfortable and realistic moisture-absorbent material that prevents slipping during performance. For musicians playing in large groups, the new Sound Focus feature ensures the RD-700NX cuts through the densest mix without adding compression that colours the tone, and is customisable based on the type of musical performance. Combined with SuperNATURAL technology, Sound Focus provides enough presence without sacrificing any essential expressivity. New One Touch Piano feature provides instant access to three acoustic pianos and three E. Pianos with the touch of a button. In addition to Roland's finest acoustic and electric piano sounds, the RD-700NX is filled with hundreds of additional quality sounds for performance versatility, including organs, strings, synths, rhythm sets, and more. Navigating the vast library and editing sounds is easy with the new high-resolution display, which provides clear visibility and an intuitive graphic interface.